You have to delete Seven_UA folder completely and its associated folders. Then reinstall seven_ua to some other folder like seven1. Then it will work again. Tried what you suggested but it didn't fix the problem. and works is I inject the drivers. I see you are at pack so go to uaDVD\sources, right click a .wim file and choose the zMountdir cleanup and try again if you have the Right click options. When it initially mounts after copy you should watch those windows and it prob tell you unable to cleanup zMountdir. Occasionally it does that. definitely need to leave everything alone, don't jack with the folders or have them open or nothing. Do that separately if you want after it copies and finishes. 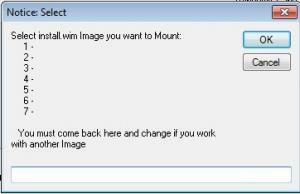 If it tell you unable to cleanup zMountdir, right then you should Cleanup the Mountdir. The command windows after DVD copy have always reported no errors. Right clicked on install.wim did a clean zMpuntdir and cleanup was successful. Tried packing image again with same error. was able to look at the files in C:\zMountdir. Did an unmount then a cleanup tried packing again still failed. I don't know why but never had these kind of problems till Seven 64. If I don't mess with the folders while the Se7en_UA is doing things I can go straight through. I'm looking for the answers. Has made me want to just quit and go back to x86 but i love a challenge. MS throws boatloads at us but we overcome and eventually this will be figured out. BTW, The cmd windows output is easier to see whats going on and not that Nod32 box. Trying to reword that. Can some of u tell me the steps OR meaning of each check box actions to proceed!! Its so tough to proceed after installing and running the prog. 1. I have my iso extracted in a drive of 250GB. 2. I run the prog and get the box with all options and choices to be checked/uncheck - isn't it? and I can't check the following options. to extract as I have done it for him to work! Then it says "yes" to copy or "No" to delete - what is going 2b deleted ? NB: R U creating any log file 2b seen, whats going behind my eyes? The attached image1 what path do I write here? The attached removed what path do I write here? image you want to mount. for me I enter 4 for ultimate. to mount or unmount etc the image that you've choosen. usable then add drivers etc. I Bold this for a reason when you first start it, nothing works with an iso unless you burning it. Can also copy an EXTRACTED ISO from another folder or Drive. Rapidshare same as that other, gotta wait if a free user. I'm not premium user. I'll upload a new version let you try it. Didn't see any error on the cmd windows during the dvd copy. But it did report one file skipped. when I do the pack image no cmd window shows before I get the error. but no other programs except se7enUA but that didn't help either. I really want to try the features and packages in the new verion. Send your ini again in pm for this 605. A few have same problem. You not disabling the Pause at pack? make sure thats unchecked. What happens in that cmd window is more important to see whats going on. Do you have UAC turned off? click your icon on Start top right. Change user Account controls. Slide all the way to bottom. Have to reboot. You can reenable later if you want.